Beautiful stretch bracelet made from agates, crystals and silver plate. 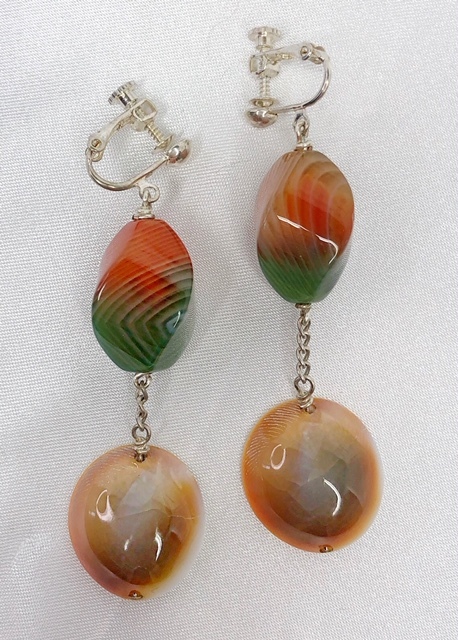 A delightful pair of earrings with moon shells and incredible agate with shadings of a variety of colors. There is a calmness about this casual creation. Botswana Agate: sustains attentiveness to detail. Silver: (Plate) is excellent for mental, emotional and physical releasing/cleansing. it works on the mind and emotions to see the overview of situations. It helps with emotional balance and patience. This dramatic ‘Statement’ piece highlights to wonder of Nature with its boundless variations of color and yet all aspects flow together in harmony. 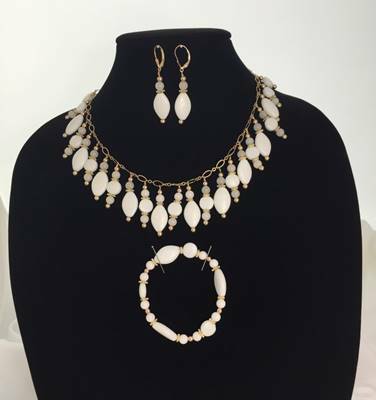 This necklace will never go unnoticed! Carnelian: Stimulates the energy of love and joy. It clears negative energy, allowing light to enter and transformation to occur. It has a stabilizing effect on energy in the home. Carnelian awakens inner talents and creativity. Tiger Eye: Helps to gain insight, to concentrate, to perceive and think more clearly, and to organize scattered details. Calms turmoil, eliminates the “blues” and encourages optimism and enthusiasm for life. Stimulates wealth and enhances the ability to maintain wealth. Tiger Iron: Brings power that is immediate and obvious (be careful what you ask for). 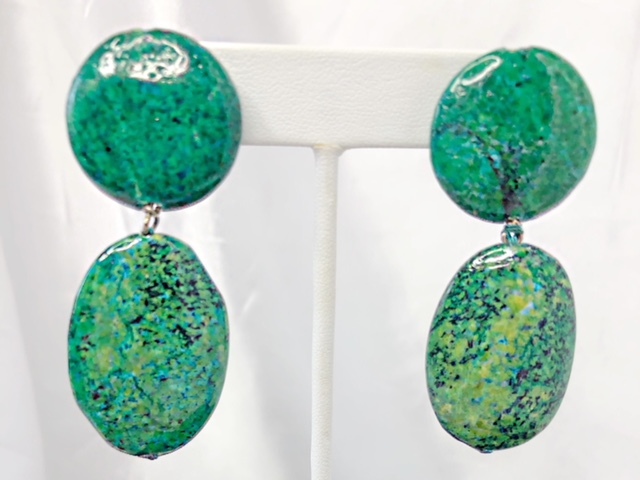 Agates: Agates foster love, create an appreciation of nature and soothe emotions. Agate is an excellent stone for re-balancing and harmonizing body, mind and spirit. It cleanses and stabilizes the aura, eliminating and transforming negativity. It enhances mental function, improving concentration, perception and analytical abilities. It soothes and calms, healing inner anger or tension and creates a sense of security and safety. Agate is a stone of strength. It is also known as a good luck stone. This is a very special creation inspired by the carved black agate pendant of a Mother Elephant caring for her baby elephant. This precious pendant is surrounded by bright tiny crystals which further enhances this moving scene. 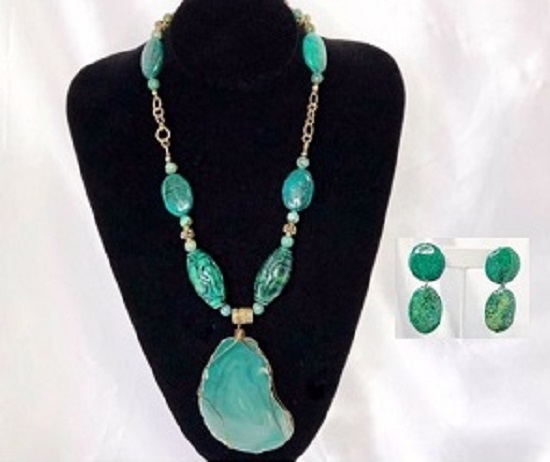 This necklace emphasizes the wonder of Nature. Obsidian: Integrates mental balance. It also assists in physical balance. ‘Spectacular’ is the only way to describe this amazing necklace. It is a combination of agate and tiny crystals. The two light stones were intentionally inserted for unexpected contrast. 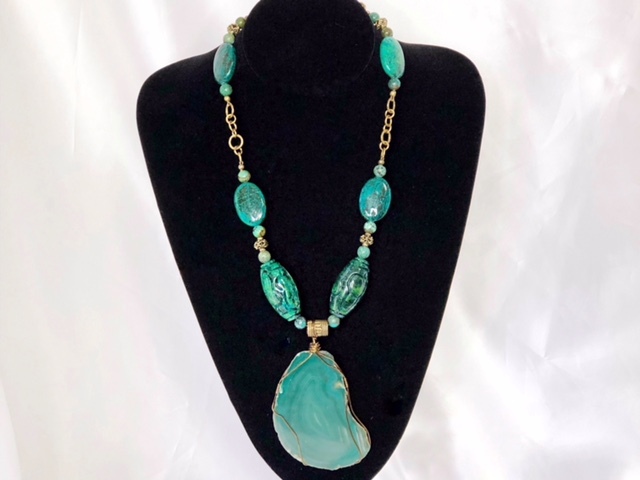 This necklace was designed and created by a guest designer and therefor “Only Yours Jewelry” cannot guarantee that this is a one-of-a-kind creation. Agates: All agates foster love, create an appreciation of nature and soothes emotions. Agate is an excellent stone for rebalancing and harmonizing body, mind and spirit. It cleanses and stabilizes the aura, eliminating and transforming negativity. Agate enhances mental function, improving concentration, perception and analytical abilities. It soothes and calms, healing inner anger or tension and creates a sense of security and safety. Agate is a stone of strength. It is also known as a good luck stone. stimulating the energy flow through your meridians. They ground you and connect you to Mother Earth, as well stimulating healing, personal growth and spiritual development. Blue Agate: Provides perceptiveness to situations and awakens inner talents. This is a very special bracelet of midnight blue faceted agate with a silver center bead. Beautiful! releasing/cleansing. Silver works on the mind/emotions to see the overview. It offers emotional balance and patience . water pearls and light green river shell. It also has periwinkle round facetted crystal beads interspersed.